With her perpetually scowling face, Grumpy Cat is arguably the most-recognized feline alive right now. But that doesn’t mean there aren’t any up-and-comers aren’t waiting in the wings to become the next big thing. 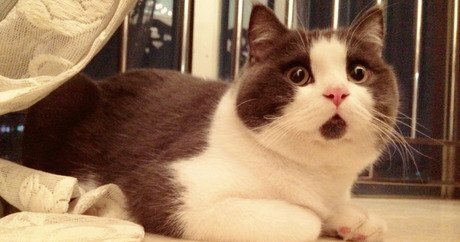 Banye, an 11-year-old British Shorthair in China, is currently getting a lot of attention on Duitang, a Chinese social-media site similar to Pinterest. The cat’s Shanghai-based owner is simply called Winnie. Whereas Grumpy Cat’s famous frown made her ideal for seemingly endless pessimistic meme fodder, Banye’s appearance resembles a cat in a state of human surprise — with a patch of dark fur on his chin (that could be mistaken for an open mouth) and wide eyes. Speaking of Grumpy Cat, she’s slated to star in the feature-length movie, Grumpy Cat’s Worst Christmas Ever on Lifetime November 29.